Join us in San Francisco and start learning the skills to increase your income 10 times with our 2-day microblading training + 6 months of continuous mentorship. Our microblading classes in San Francisco are a 2-day live event. No previous experience is required. So, whether you are completely new to the industry or a skilled artist looking to get ahead, our intensive microblading classes San Francisco is perfect for you. And once you complete your 6 month training, you will become a microblading artist earning more money with minimal working hours. Pay for the microblading classes San Francisco in full. After you complete the payment your balance will be $0.00 and we will register you for the course. You will receive an email to confirm this. A deposit payment is necessary to reserve your place at the training. A deposit is only an initial payment. Once you complete it, your remaining balance will be $2900, plus a processing fee. Your should pay the remaining balance one week before the start date of the class when paying with card. In addition, pay on the day of the class when paying with cash, to finish the registration. Call us or text us and request a financing form to see if you qualify for same-day financing. 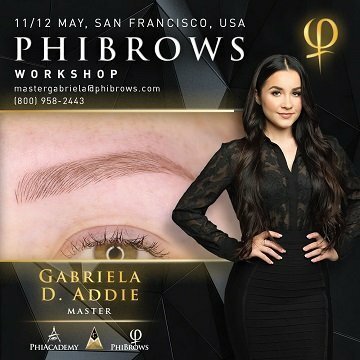 Our PhiBrows Microblading Training is an intensive 2-day live microblading course in San Francisco taught by master artist Gabriela Addie. The 6-months training is divided into 11 levels, which break down every step of the craft. Every student of the microblading course in San Francisco will receive a Premium PhiBrows Microblading Kit. This kit is intended for up to 80 clients, and will serve you both during the training session, as well as in later practice and work. The PhiBrows Certification is the most highly regarded microblading achievement in the industry. After finishing our microblading training in San Francisco, all you need to do is pass all 11 levels you have covered with master artist Gabriela Addie via the Craft Master app inside 6 months. Once completed, you will receive your PhiBrows Certificate. As an official PhiBrows artist and a student of Art of Beauty Academy USA you automatically join the PhiCommunity. You get featured alongside other artists and even masters from around the globe on the PhiBrows World Map. Allowing you to gain clients and their trust across USA and the world. An average microblading treatment in the Bay Area can rise to $1500 per single treatment. As a new artist you can start from $600. And the average cost to you is just two hours and $7-8. That’s an extremely good profit margin. Plus, you already have supplies for up to 90 clients in the kit you receive from us. How long do you think it would take to earn back your $3500? A week? By then you’ll already be making a profit.